Saturday morning found us out the door by 7 in the morning. Our first stop was QuikTrip. Brooke loves QT and gets very few opportunities to visit them, so we darn near stop at every one we pass! This time was for drinks and a couple of pretzels. What? You've never had soft pretzels for breakfast? We arrived at City Market and started browsing, but not before being asked to sign a petition to legalize marijuana. I think it was for medical, but I wasn't really paying attention. The weather was already heating up quite a bit and we had a lot to cover. 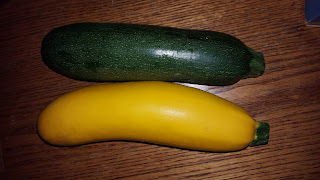 We stumbled across some yellow zucchini, which none of us had ever seen. Brooke bought one yellow and one green for us to compare, and one yellow for my mom. They are the prettiest color of yellow. A lot deeper yellow than the yellow squash I'm used to seeing. We tasted some new things, had a lemonade, tipped a street performer, and watched Kevin have a conversation with a meth head. Upon leaving there, we went across the street to the Chinatown Food Market. I'm not sure I would have ever found myself in an Asian market if I hadn't met Brooke. There are very few things in there that I can pronounce or recognize. Let's just say that I'm pretty naive about the foods eaten in our world. Of course, there were things she needed there, too. Monica and Simone wanted to see Brooke and to have her see their apartment, so we stopped by for a bit, then headed back home.